The Agilent R11644A is a Mechanical WR-28 Calibration Kit. The Agilent R11644A calibration kit contains the precision mechanical standards required to calibrate the systematic errors of Agilent network analyzers. 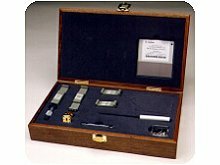 This calibration kit has a precision airline for performing the Thru-Reflect-Line (TRL) calibration, the most accurate error-correction technique for coaxial measurements. This R11644A waveguide calibration kit is used to calibrate network analyzer systems (such as the Agilent 8510, 872x, or PNA series). With the calibration data properly loaded in the network analyzer and a measurement calibration completed, systematic errors are minimized.